Homepage What is Child Abuse and Neglect? (1) Causing bodily injury to a child through any recent act or failure to act. (2) Fabricating, feigning or intentionally exaggerating or inducing a medical symptom or disease which results in a potentially harmful medical evaluation or treatment to the child through any recent act. (3) Causing or substantially contributing to serious mental injury to a child through any act or failure to act or a series of such acts or failures to act. (4) Causing sexual abuse or exploitation of a child through any act or failure to act. (5) Creating a reasonable likelihood of bodily injury to a child through any recent act or failure to act. 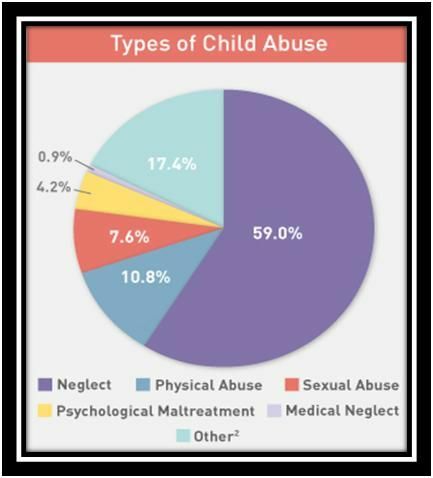 (6) Creating a likelihood of sexual abuse or exploitation of a child through any recent act or failure to act. (7) Causing serious physical neglect of a child. (i) Kicking, biting, throwing, burning, stabbing or cutting a child in a manner that endangers the child. (ii) Unreasonably restraining or confining a child, based on consideration of the method, location or the duration of the restraint or confinement. (iii) Forcefully shaking a child under one year of age. (iv) Forcefully slapping or otherwise striking a child under one year of age. (v) Interfering with the breathing of a child. (vi) Causing a child to be present at a location while a violation of 18 Pa.C.S. § 7508.2 (relating to operation of methamphetamine laboratory) is occurring, provided that the violation is being investigated by law enforcement. (A) Is required to register as a Tier II or Tier III sexual offender under 42 Pa.C.S. Ch. 97 Subch. H (relating to registration of sexual offenders), where the victim of the sexual offense was under 18 years of age when the crime was committed. (B) Has been determined to be a sexually violent predator under 42 Pa.C.S. § 9799.24 (relating to assessments) or any of its predecessors. (C) Has been determined to be a sexually violent delinquent child as defined in 42 Pa.C.S. § 9799.12 (relating to definitions). (9) Causing the death of the child through any act or failure to act.